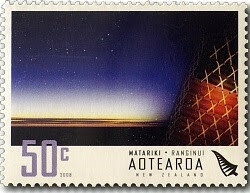 Virtual New Zealand Stamps: 2008 Matariki - Maori Culture. For the Māori people, the night skies in June traditionally have huge significance: they herald the dawn of a new Māori year. In te reo Maori, yhe Māori language, Matariki is the name of the Pleiades star cluster, in the constellation of Taurus the Bull. In traditional times, Matariki was a season to celebrate new beginnings and was important for agriculture in establishing the correct time to plant crops. It was also a good time to instruct young people in the lore of the land and the forest as being the colder months much more time was spent indoors. The constellation is also believed to have been used by navigators. See our post - 2007 Southern Skies. The first rising of the Pleiades and of Rigel (Puanga in Māori) occurs just prior to sunrise in late May or early June, and this indicates that the old year has ended and the new year has begun. The annual appearance of the seven stars of ‘Matariki’ (or the Pleiades star cluster) signals a time for renewal, reflection and celebration! The actual time for celebrating Matariki varies depending on the iwi (tribe). It has become common practice for various private and public institutions to celebrate Matariki over the period of a week or month anywhere from early June to late July. 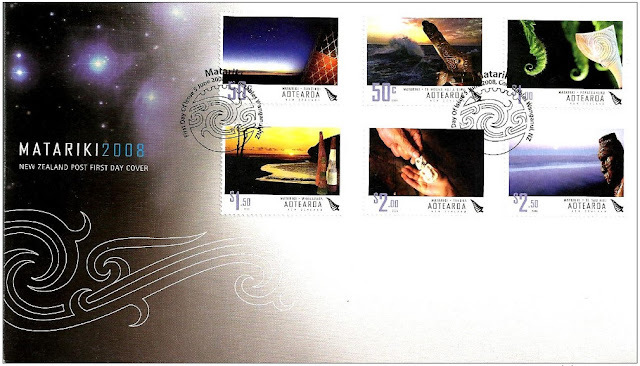 This is the first in a series of annual Matariki stamp issues, exploring different aspects of Maori culture and heritage. In this first issue we take a fascinating journey through Maori history and culture. We celebrated not only the constellation itself but also connections that the Maori spiritual world has to the sea, to the land and to family (whānau). We also learn about the Maori worldview in which the gods, Sky Father Ranginui, Earth Mother Papatūānuku and their children, personify the dramatic forces of nature. I like these stamps as they convey so much about the deeper, not so well known spiritual side of Maori culture. Enjoy these beautiful stamps but be sure to read their story too. In this stamp issue there is so much more than just a pretty set of pictures. 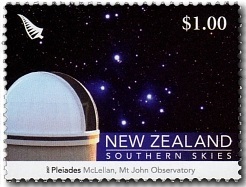 The first stamp in our series depicts the seven stars of Matariki in the sky domain of Ranginui. It is said that in the beginning Ranginui and Papatūānuku were in close embrace, with their children in the darkness between them – but their children decided they must separate their parents to illuminate the space between in which they lived. Tāne, god of forests and birds, placed his feet against the breast of Ranginui and forced him into the heavens, leaving Papatūānuku as the Earth below, the foundation of life and all human activity. The children were horrified at the pain they had caused they parents but what was done could not be undone and so remains until today. The rain is Ranginiu's tears for his love and the raising mist Papatuanuku weeping in return. Te Moana nui a Kiwa (The Great Ocean of Kiwa) is the Māori name for the vast Pacific Ocean – crossed by their Polynesian ancestors who founded settlements in island groups wherever they travelled, including Aotearoa (New Zealand). 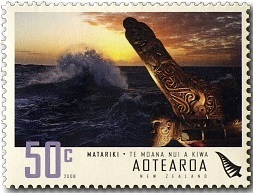 Our stamp features the tauihu (decorated prow) of a war canoe, thrust forward into the Ocean’s mighty waves – a symbol of discovery and adventure, the human need to see beyond the horizon and the spirit that drove Māori forefathers to set out into the unknown. Māori history, culture and identity are closely integrated with the land (whenua), as the foundation of sustenance, a medium for building and travel and a ground on which to stand with dignity and pride. 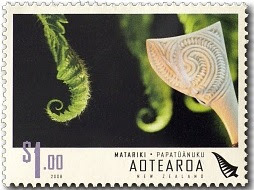 This stamp reflects the koru, the unrolling of the native New Zealand fern symbolizes the land’s role as a food producer and its place in Matariki – which appears in the southern skies when the harvest is complete, food is available for feasts and celebrations, and it’s time to prepare for the next growth cycle. Beyond being a time for festivity, Matariki is also a time of reflection, of remembering and celebrating the lives of family members and farewelling them into the spirit world. It’s closely tied to the concept of ‘whakapapa’ (or genealogy), which relates to family relationships, to ancestors (the anchor points of past generations) and their descendants, and to children, the adults of the future. 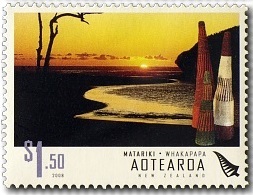 Our $1.50 stamp honours the spirit of whakapapa; the three cones symbolise the family group, witnessing the start of a new day. Watching a sunrise or sunset is a special time to spend alone or share with someone. I can relate to it being a time of reflection, to look forward to the day or year to come or to look back upon what has been before. The word ‘takoha’ refers to a pledge or token, usually in the form of a gift. It’s an integral part of Māori life – particularly at Matariki, when the celebrations and feasts require people to unite as one, and share or give what they can to make the occasion one to remember. 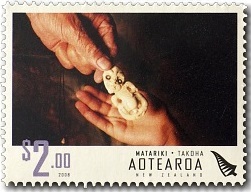 Gifts also represent social contracts between parties, handed for safe-keeping from one generation to the next and becoming important and valued heirlooms – such as the tiki neck pendant depicted in our $2.00 stamp. 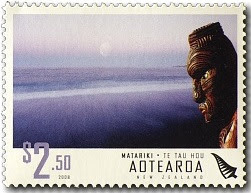 In my post on the hei-tiki, (See our post Heitiki) I took the meaning of this stamp as being the passing of the tiki from a man to a woman as a token of love but from what NZ Post wrote above it seem more like this is the passing of a tiki from an older to a younger generation. In the 21st century, Matariki has become a major milestone in Māori life, marked by events such as art exhibitions and festivals that continue long into the night. New Zealand’s national museum, Te Papa Tongarewa, hosts a special celebration – attended by several hundred guests – featuring traditional oratory and artistic performances. Matariki is a time to look forward to the promises of the new year, and enjoy dreams of a better life to come. Like all NZ Post stamp issues, this one came with the usual First Day Covers and miniature sheets. There was also a special collectors edition First Day Cover as well. First Day Cover featuring all six stamps. Miniature Sheet - also featuring all six stamps. Limited Edition - Miniature Sheet & Special Cover seen below. Only 2000 were produced and signed by Dr Sidney Moko Mead, Maori historian and writer. Sir Sidney (Hirini) Moko Haerewa Mead KNZM (born 8 January 1927) is a New Zealand anthropologist, historian, artist, teacher, writer and prominent Māori leader. Initially training as a teacher and artist, Mead taught in many schools in the East Coast and Bay of Plenty regions, and later served as principal of several schools. After earning his PhD in 1968, he taught anthropology in several universities abroad. He returned to New Zealand in 1977 and established the first Māori studies department in the country. Mead later became a prominent Māori advocate and leader, acting in negotiations on behalf of several tribes and sitting on numerous advisory boards. He has also written extensively on Māori culture. From 18 to 21 September 2008, 430 exhibitors presented their philatelic treasures at the 2008 Vienna International Postage Stamp Exhibition. NZ Post attended the exhibition and issued this miniature sheet to commemorate WIPA08 - a world exhibition with 12 competition classes held from September the 18th to the 23rd at the Austria Center in Vienna. The theme of the exhibition was 'the future of philately'. 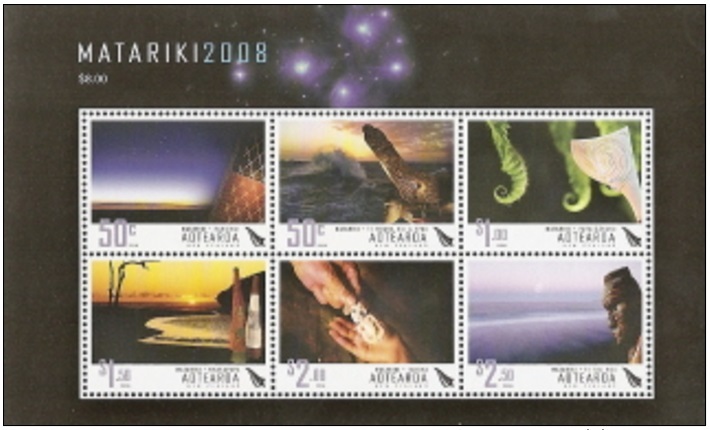 The special collectors miniature sheet showing three of the 2008 Matariki stamps. 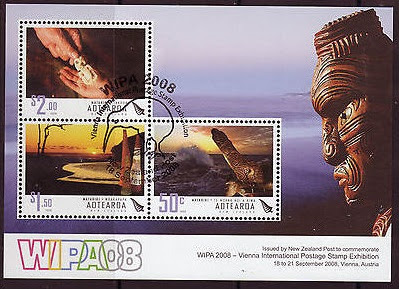 Used example of this sheet showing the official NZ Post cancel. Technical information - 2008 Matariki. Technical information - WIPI Exhibition. Somehow I have missed this page. My grandson showed it to me yesterday. I awoke earlier and came back to read it again. Very well done. As the first Matariki issue it acts as an introduction to the series. I feel it does this. Like you said Allan, there is a deeper, spiritual side to these stamps. I like the way this was presented here. 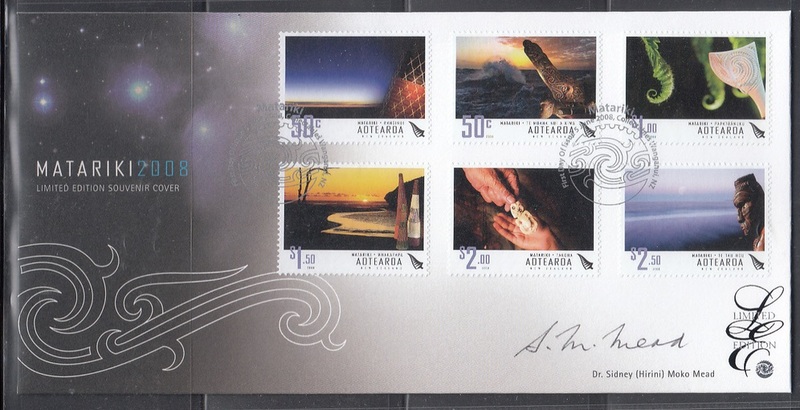 Well done NZ Post and you Allan.